Winter music is inspired by winter and sounds like winter, yet winter contains a wide range of inspirations and sounds: from ice-locked ships to children’s games, from piano flurries to fronts of drones. Its variety is its beauty. Just as there are many experiences of winter, from seasonal depression to sport-filled joy, there are many timbres fitting for the season. This year’s selections arrive on the heels of one of our most popular articles, The 25 Best Winter Albums of All Time. We’ve been amazed at the response to this article, as well as by the number of people seeking out last year’s winter music column. Our hope is that this year’s ten picks (which include two from late 2014) will help our readers to appreciate the cold, to cherish the snow and to embrace the onset of the white. And now, in alphabetical order, A Closer Listen presents its picks for The Year’s Best Winter Music! The album was recorded in December, but released in May. These thick drones became the score to a European winter that hung around months after it had been expected to lift. The music captures the ennui of never-ending cold, a claustrophobic fugue in which all hope seems extinguished. A nostalgic air is created by Foresteppe’s lovely, wobbly music, the aural reflection of a friendly winter in a rustic Russia. The physical release (now sadly sold out) included a pair of postcards and a strip of diafilm: tiny treasures from a forgotten childhood. This lovely EP was first released on Christmas Day (a bonus track was added later). Title aside, these pieces flurry down like the first snow. 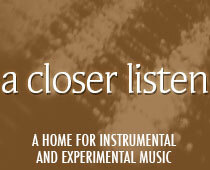 Gentle piano, celesta and cello combine to knit a fluffy blanket of comfort. One can imagine the hot chocolate, the marshmallows and the fire in the hearth. Years of anticipation ~ an EP here, a compilation track there ~ have finally culminated in the release of 1816, a concept album about “the year with no summer.” Pleq and Spheruleus (with friends) have produced a winter classic, one we expect to be enjoying for years to come. The last of this year’s selections to be released, North extends a tender olive branch to the season of cold and snow. The field recordings lend the album an authentically chilled timbre, while the piano acts as the warm winter coat. An alternative soundtrack to a vintage Scandinavian film, Waiting for the Thaw is romantic yet forlorn, a reflection of doomed love caught in frozen ice. The sweet violin of Heike Grafe provides just the right amount of gravity to the opening and closing tracks. Viento includes some of the coldest, sharpest recordings that have ever been captured and presented to a larger audience. Wind whips metal into a frenzy; snow whirls and sighs. English endured these conditions himself; now we can hear what we went through, and be glad for our relative safety. As the December light slowly bleaches from the skies, dropping the Northern Hemisphere into a blanket of grey, humans watch the skies and yearn for warmth. Yet the solstice is the first day on which the sunlight increases. Jason Corder captures this contradiction on Light Loss, offering a welcome reminder of gain. Saxophones and snow may not seem like a natural combination, but in the hands of Rutger Zuydervelt, their interplay seems instinctive. By shrouding the brass with electronic textures, the artist adds an unexpected graininess, producing a long-form piece of slow, serene anticipation. This beguiling seasonal compilation came in too late to be reviewed in 2015, but as it has much to do with the solstice and the winter holidays, we’ve chosen to include it here. Folklore Tapes has done a superlative job in finding an eclectic assortment of subjects and sounds, from David Chatton Barker’s wildly experimental “Wheel of Life” to Sam McLoughlin’s festival-reflective “Tangerines in Socks” to Mary Stark’s restrained, choral “Holly and Ivy.” The tape is packaged with essays and an evergreen bough ~ an extra touch that makes the set seem like a gift, even if one purchases it for one’s self. Our year-end lists only include what we review, but that’s a nice addition, thanks!